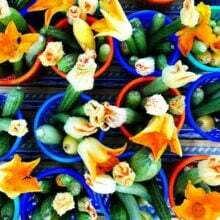 Today is National Zucchini Day. Yes, there is a special day devoted to the squash. I don’t know who decides on these days, but I am happy to celebrate the zucchini. It really is perfect timing for National Zucchini Day. We are all racking our brains trying to figure out what to do with the vegetable, so why not make a day of it and go zucchini crazy? I am going to kick-off National Zucchini Day by making Zucchini Coconut Bread. I love zucchini bread and this Zucchini Coconut Bread is my new favorite zucchini bread recipe. I’ve already made it three times this summer. It is a great recipe for using up the summer zucchini! 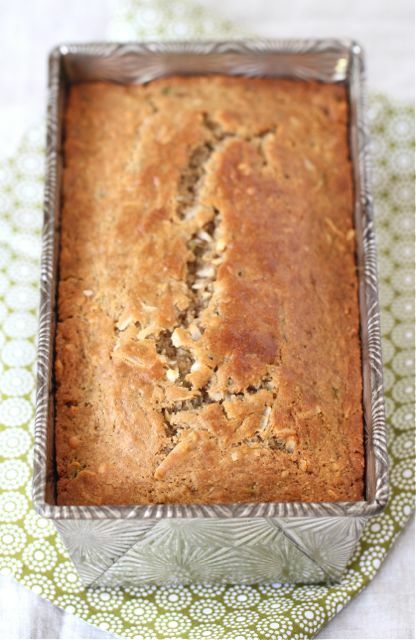 This bread is easy to whip up and is on the healthier spectrum of zucchini breads. The bread is made with whole wheat flour, Greek yogurt, and coconut oil. There is no butter in this bread! Don’t worry, you won’t miss it. The coconut oil gives the bread an incredible flavor. The bread is also super moist thanks to the zucchini and Greek yogurt. The shredded coconut compliments the zucchini nicely and adds a little extra coconut goodness to the loaf. Shred up some zucchini and make Zucchini Coconut Bread! It is the perfect way to celebrate National Zucchini Day. 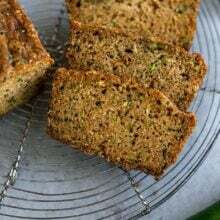 You can’t beat a warm slice of zucchini bread! Mmmm! I think I will eat Zucchini Coconut Bread for breakfast, Zucchini Ribbon Salad for lunch, Chocolate Fudge Zucchini Cookies for dessert, Baked Zucchini Fries for dinner, and Zucchini Chocolate Chip Brownies for dessert. Yes, I am going to have two desserts today:) So maybe that is a zucchini overload, but go big or go home, right? It’s time to celebrate the zucchini! And if you are in need of more zucchini ideas, check out these tasty 35 Zucchini Recipes! Pour the batter into prepared pan. Bake for 50-60 minutes, or until a toothpick inserted into the center comes out clean. Let zucchini bread cool in pan for 10 minutes. Carefully remove the bread from the pan and cool completely before slicing. A wonderful bread! So moist and delicious looking. I need to stop by this store this morning…I think I’ll be picking up zucchini! 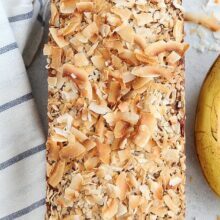 I’m always excited when coconut is added to baked goods- yum! Oh yum! This sounds so good. I am definitely going to be making some soon. I have lots and lots of zucchini! Mmm such a treat! And a great way to use up zucchini! 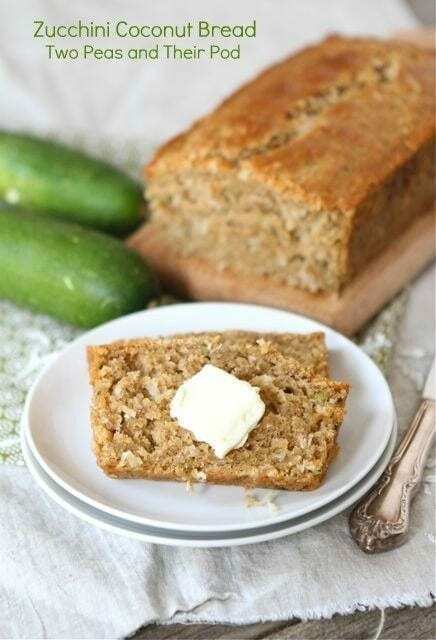 I want to celebrate National Zucchini Day by making this bread!! Looks beautiful! I love coconut bread and adding zucchini is a great idea!!! I love zucchini and I love coconut too but had never thought of putting them together! Thanks for sharing! I am going to be pinning this and tweeting about it YUM! Love the coconut twist on zucchini bread. Great idea! Thanks for the link love. This sounds sooo good. I have a zucchini bread(actually 2) in the oven right now from a recipe on skinnytaste that is low fat also and so good,too. My kids get all their zucchini this way and they like zucchini tots too. Thanks for your recipes!!! This really sounds delicious! I am loving the idea of coconut oil in baking; adds so much good flavor. Thanks for including my savory zucchini muffins too. I had no idea it was National Zucchini Day! I’m loving all of these recipes! This looks amazing! 🙂 Buying zucchini at the farmers market this weekend just to make this! I always seem to miss the national food days… Love the coconut version of zucchini bread – can’t wait to try it with coconut oil instead of butter. Thank you for sharing, Maria! I always seem to miss the national food days.. Your coconut version of zucchini bread sounds amazing! Thank you for sharing, Maria! I love the sound of this! Am interested to try the coconut oil in a bread. Looks yummy. Thanks for sharing! Is there any reason why I couldn’t use all whole wheat flour? Can you use applesauce instead of the Greek yogurt? I haven’t tried using applesauce, but I am sure you could use it. Let me know if you try it! Wow, this looks like such a delicious variation of tradional zucchini bread! We have LOTS of zucchini in our garden this year, so I’ll have to give it a try soon! We just made something similar with chocolate chips and it was AMAZING. Such great flavors! that loaf pan is beautiful!!! 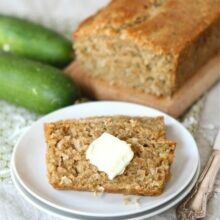 and i love that it’s a fun twist on the standard zucchini bread! Happy National Zucchini Day! What a great way to celebrate it 🙂 This bread looks fantastic! I love that it is on the healthier side too! No way, we JUST made something similar, except loaded with chocolate chips! I absolutely love the combo. It was gone in no time. The zucchini and coconut make for a perfect bread texture. No way! I just made something similar a few days ago, except loaded with chocolate chips! It was gone in no time. 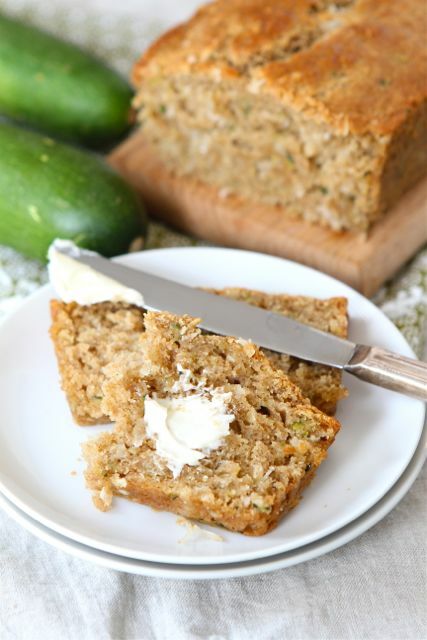 I love the zucchini and coconut combo…it makes for the perfectly textured bread! This sounds wonderful! I love that it’s sweet but has some healthier ingredients with the greek yogurt and the whole wheat flour. I will be making this today! Loving everything about this bread! Yum! Any excuse to celebrate is great to me, and zucchini is definitely worthy of it’s own day! This sounds like a perfect breakfast and snacking loaf! sounds like a delicious combo!! I’m a sucker for coconut in pretty much anything! What a tasty way to use up all that pesky squash! yum! Oh this sounds divine. Could you use all white flour? Yes, you can use all white flour. I’ve made zucchini cake once this season but have been slacking on the quickbread love! Totally making this next! Love the addition of coconut. We adore zucchini bread, but having new recipes for it always helps when you have a garden full of little and not so little zucchini. Yum!! This loaf looks amazing!! oh yes oh yes oh yes!!!! this looks so dang good right now!!!!! Nice interesting recipe. Never thoubght of coconut in zucchini breads. Made this tonight. Had to buy a loaf pan but had pretty much all the ingredients. O. M. G. This came out PERFECT!! The crust has a slight crispness. SO much flavor. Wow. I will make this a lot. Super easy and SO delicious!!! Thank you for the great recipes. Always so easy to follow. I am so glad you are enjoying our recipes! I like the idea of coconut oil in there. I made a bread with zucchini, coconut and cranberries, but I think with the coconut oil, this would be even more awesome. I love this! Every time I think my zucchini might be done for the summer, another one or two pop up! I just picked another big one last night; I can’t wait to make this bread! 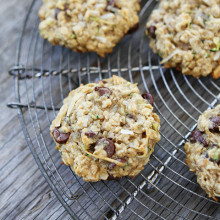 I wouldn’t have thought of combining zucchini and coconut but this sounds delish! I loved the use of coconut oil and any use for zucchini these days is a gift! i love zucchini anything! love how you added coconut as well. the two combos sound amazing! Can you tell me where I can get coconut oil? And you said melt it? Is is a solid? Glad you liked the recipe. I will have to try toasted coconut next time. Do you think dessicated coconut could be used in this recipe ? I got a great deal in a bunch and would live to use it. If so, would it be a 1:1 ratio? I haven’t tried it, but I am sure it would be fine. I would use the same amount. Just made this again today. Special request from my father-in-law. He wanted a loaf for himself. I made one like normal and made a 2nd one with no coconut & dark choc chips. I love how crispy the crust is out of the oven. Is there a way to keep it crispy? We wrapped the last one in foil later and I wonder if that made the crust moist or if it’ll happen no matter what. Any suggestions? If you wrap the bread while still warm it will soften. Lightly cover it so it doesn’t get too moist and make sure the bread is completely cooled. I am so glad you like the recipe. I made this the other day – so good! Ahh, the crack in the top of that loaf is perfection! And no butter, I must try this. I could use a little less butter in my life 🙂 Thanks for the bundt cake love! Hi, this looks great. I’m always looking for ways to use up zucchini from the garden. However, I’m lactose intolerant and can’t use yogurt. Any suggestions for what I could use instead of yogurt? Made this today for an after-school treat for the kids. All I can say is they better hurry home before I eat it all! So good. My new favorite. I have had coconut oil in my food storage forever, I finally go to use it. Also didn’t have yogurt on hand, so I used low-fat sour cream instead, worked great, turned out awesome. Glad I doubled the recipe! Love this! Bought coconut oil for the first time… just so I could make this recipe. I only had vanilla-flavored Greek yogurt but it still came out just sweet enough. Thanks!! Wow-what a beautiful loaf pan! The zucchini bread looks delish. I made this bread yesterday and it is SO GOOD!!! Who knew that zucchini and coconut would be a match made in heaven. And with nutmeg…swoon. This was absolutely amazing! The only change I made was that I used half the vanilla, and the other half teaspoon I used coconut extract. Also I only had whole wheat flour. It was slightly dense but still tasted incredible! So delicious! I substituted the white flour for spelt and left out the granulated sugar (still leaving in the brown sugar ). It was plenty sweet with the sweetened shredded coconut. This is definitely going into my recipe book as a favorite! I just made this and it’s really good. I substituted regular flour for ground oats as I can’t have wheat and added a bit more yoghurt as the oats soak up lots of liquid. I also reduced the amount of sugar to maybe four teaspoons but I still found it almost too sweet. Overall – excellent bread. This is beyond delicious! So moist. Perfect for breakfast. I just made these muffins. I substituted Coconut Greek yogurt as opposed to plain Greek yogurt and made muffins as opposed to a loaf but I must say, these are fantastic. I new favorite for sure. Unsweetened will work. It will be a little less sweet though. Hi there, I’m going to make this recipe with my kids tomorrow but don’t have any coconut oil. What can I sub? Vegetable oil? Applesauce? Thanks! Yummm, this batter rocks. “Any thoughts on time/temp adjustments for converting into muffins?” she asked right after popping said muffins into the oven… I’ll be guesstimating. Just made this tonight, and it is amazing! This will definitely become my go-to recipe for zucchini bread. Thank you for the recipe! Made a double batch of this for my hubby and me to each take to work, and wow is it fantastic! I’d never even bought coconut oil before, but I really like it and think I will incorporate it into my cooking/baking more often. Thanks for another great one. Love all the recipes on your blog! Just made this — used the coconut oil but not the coco shreds. The texture was perfect! Moist and light with that nice slight crispness that coconut oil brings — and it tastes great! Thank you! Can you make a gluten free version of this? If using gluten free flour what adjustments need to be made? Thanks so much! It looks scrumptious. Delicious! I added toasted macadamia nuts which was a nice contrast. Next time I will cut out 1/4 cup of the sugar since the coconut adds enough sweetness. Just wanted to thank you for some of the healthier recipes you’ve been posting. I use whole wheat flour and coconut oil all the time, and usually swap out sugar for coconut sugar and/or honey, and I just found a bag of zucchini at the store for $1.18 and there are a bunch of them – on the clearance rack in March – I was excited! Love this recipe, I’ve made it several times. I have a bunch of apples sitting around right now and am wondering if I can use them instead of the zucchini in this recipe?? If I make sure to squeeze out all the liquid it could work, what do you think? Pingback: Baked Zucchini with Bacon | Never Enough Thyme — Never Enough Thyme - Recipes with a slight southern accent. Very moist and delicious. I added chocolate chips and it was yummy. Do you measure the zucchini before or after you squeeze it? I made this the other day and it was delicious, and promptly devoured by my four kids. I still have lots of zucchini on hand, so I made a couple more loaves today, only this time I toasted the coconut first! Wow! That put it over the top! I made this today but I made the mix into muffins! So good! I cut the sugar to just the 1/2 cup of brown sugar, and it was still sweet enough for us. I will be making this again! Just made this recipe and it was yummy. I had everything on hand except the sweetened coconut. I used some unsweetened coconut (adjusting it with moisture and sugar to make it equivalent). The texture of the bread was great but it didn’t have a distinct coconut flavor like I was hoping it would. Maybe my use of unsweetened coconut is the culprit. Either way, I appreciate the recipe. The whole family enjoyed it. This must be the reason that I have shrdded zucchini in the freezer! My hubby will not eat Zucchini as a vegetable, but loves Zucchini Muffins and will love this with the addition of cocnut! Yummy! THank you for all of the Zucchin recipes! This sounds great! But I have a question about the zucchini – does it have to be drained? I have lots of fresh frozen zucchini, which is very watery when thawed. When using it in recipes, I normally don’t drain it … would frozen zucchini even work in this recipe? Janice, I did not see a reply to your question….did you try the substitution? What is your recommendation? I haven’t tried coconut flour. I will have to next time I make the bread! Try using coconut Greek yogurt, it justs adds that much more coconutty goodness! Love this recipe – made once as a loaf and then 4 times for back to school muffins. Boys say that this recipe is a keeper. I just tried this recipe today…cut it in half and made 6 muffins and they were FABULOUS! May be a new favorite for me 🙂 I make more of your recipes than any blog out there-please keep them coming! I am trying to incorporate more coconut into our diet…..would there be a reason that we should NOT substitute part of the flour with coconut flour? I am new to this flour but am excited to see the possibilities! This bread is absolutely delicious. Thanks so much for the recipe. Yum! Interesting recipe with the yogurt, I am going to have to try that one! This recipe came out absolutely amazing! The butter isn’t missed at all. Sounds really good but I think I use to put walnuts in the bread also. This is my husband’s new favourite zucchini bread! Thanks! Yay, glad he likes it! This is delicious! My husband is diabetic, so I replaced the granulated sugar with coconut sugar & used Splenda brown sugar. Also used organic reduced fat shredded coconut in place of the sweetened coconut. Thanks for sharing this recipe! I really detest greek yogurt. Can I substitute something for it? I’mcurious as to why you would want to replace butter with coconut oil. I looked them up and coconut oil has more calories and much more saturated fat than butter. It would give more coconut flavour but I think coconut extract might be a better choice. I only have unsweetened coconut flakes… think that’s ok to sub for the shredded, sweetened coconut? Should I add any additional sweetener to compensate? It should be fine, maybe a little less sweet, but not much. I made these today using the recipe the way it’s written for the most part. I substituted 2 tablespoons of flaxseed for the flour, increased the cinnamon to one teaspoon and added a zip of cayenne pepper. They turned out very good. Moist and flavorful. Maybe next time I’ll use a bit of orange or lemon zest. Would definitely make these again. This is really delicious! Do you think it would freeze well? Yes, it freezes well. Glad you liked it! Tried this recipe to use up our garden zucchini! Didn’t have plain greek yogurt so I used vanilla flavoured greek yogurt and unsweetened shredded coconut. Received many compliments! I also made it through as 3 mini loaves and cut the cook time to ~35-40 min. Turned out moist and delicious! Will be making it again soon! Made this for my two girls (7 and 4). They loved it! My older daughter is less picky so I wasn’t surprised when she gobbled it up. But the little one is my tough critic! She asked for it again the second day and cleaned her plate both days. I really liked the coconut flavor and the bread came out nice & moist. Printed the recipe out today to add into my 3 ring binder! I’ve made this recipe many times. I reduce the sugar, add dark chocolate chips and make muffins instead of a loaf. They are always a hit! Thanks for the recipe! Would this recipe work for cupcakes as well? If not what can i change? Yes, it should be just fine, just reduce the baking time. Could I make this vegan?